Just because you're short on time doesn't mean you have to sacrifice healthy, flavourful homemade food. 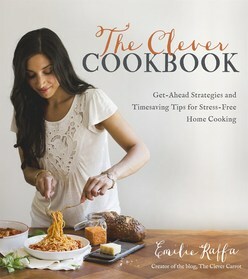 Thanks to Emilie Raffa's The Clever Cookbook, readers can cut down on cooking time while still creating delicious, complex meals. Emilie's tips and tricks include prepping veggies ahead of time, using seasoning blends instead of individual spices, infusing butter and oil with garlic and other herbs, using make-ahead basics like stocks and stir-fry sauces, marinating meats as they freeze and thaw and much, much more. Her healthy, homemade recipes range from 30-Minute Chicken Piccata to Teriyaki Beef, Roasted Vegetable Salad with Goat Cheese, One-Pot Baked Risotto, Jambalaya and more. Emilie's classic culinary training, knack for creative recipes and savvy shortcuts will help readers prepare mouthwatering, homemade meals without spending all their time in the kitchen or grocery store. Recipes for complex meals that come together in no time.